Feast your eyes on the latest innovation in small power plants. The Polini THOR 250 has allowed construction in ultralights to reach new levels transferring usable weight into, in many cases, much needed structure. 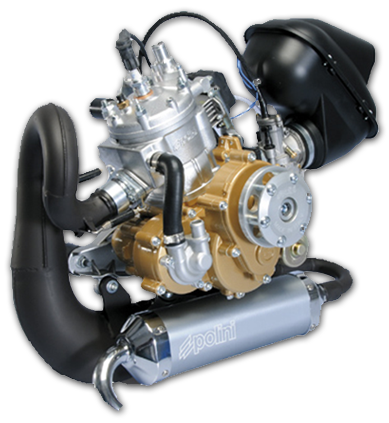 This 45lb power plant has literally replaced 70-90 lb engines and is a purpose-built Real Aircraft Engine, not some converted snowmobile motor or other that uses a belt re-drive system. This new motor is quite similar to a modern day, high performance dirtbike engine and runs as smooth as many $100K Light Sport Airplanes. Even though it is a 2 stroke, it has virtually no powerband. It starts up with the prop standing still thanks to its centrifugal clutch system. This makes for one of the smoothest idling aircraft available and improves safety. When combined with the latest technology in super low inertia props From E-Props, this package actually improves the handling of the REV by way of ultra-low gyroscope effect and no noticeable P factor at any power setting. This in turn gives the REV a feel in the air that no multi-cylinder trike can match.